I might be preaching to the choir here, BUT I AM SO OVER WINTER! We got another 8+ inches of snow yesterday, and since my husband was at work, I had to shovel the driveway and sidewalks on my own. There's a chance that I mumbled a few unfriendly words this morning when I tried to roll out of bed. I am SO sore. I always forget how much of a workout shoveling it, and I also always forget how stiff and out of shape I am when I have to shovel. But you know what's not stiff and out of shape? Roselina. 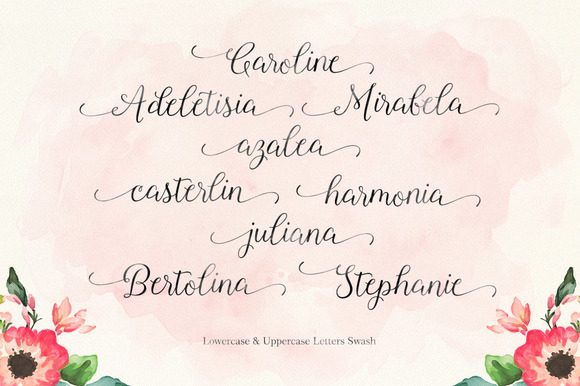 This calligraphy font is about as fluid and perfectly balanced as a ballerina. Maybe if my name were Roselina, I would have been better at shoveling. And life in general. By now you know I have a soft spot for sweet, romantic, classic calligraphy fonts. They take my breath away, the same way shoveling does. You probably have also come to realize that most of my recent Font Friday picks are from Creative Market. One of these days I should wrote a whole post on Creative Market, but for now you'll have to trust me when I say I'm addicted. The fonts are affordable, accessible, VAST, and there are lots of fonts in the $15-$25 range. Believe it or not but Roselina is just $15 right now. Yes, I purchased her. Yes, I want to clear my entire calendar and spend the whole day with a hot pack on my shoulders, and Roselina dancing on designs in Illustrator. Love fonts as much as I do? Follow along every Friday for Sincerely, Jackie's Font Friday features, and catch up on past Font Friday selections. Want even more font goodness? Follow the Sincerely, Jackie Fontabulous Pinterest board.